Since my paternal search has pretty much come to a screeching halt- I figured I needed to write about my other search- my maternal line. I have spent a considerable amount of time researching that side of my family- and it's been arduous and difficult task. Something I've come to discover is that most families pass on information much like a game of "telephone". Facts become exaggerated or distorted, actual documents have been incorrectly filled out, sometimes deliberately and, often, inadvertently. The biggest lesson I have learned regarding registrations- particularly death certifications- is that they are only as informative as the person who reported the information at the time. Often, particularly in the late nineteenth and early twentieth centuries, whomever was reporting a certain death was not equipped with the information that was required for a particular death certificate. Hence, many records list people's parents as "unknown"- or even worse, they guessed. I suppose it never occurred to them that this information could be vital to future generations of genealogists. So, first rule of thumb when researching family- take information provided by someone other than the subject with a grain of salt. At least when you are presented with an "unknown" you know to look elsewhere. I have spent years looking for people that I finally discovered (thanks to DNA) did not exist. Such is the case in the story of my recently identified third Great Grandmother. I've decided to start with the story of Louisa Knight Price Trevan. In telling any of these stories, there will be a mixture of facts- and conjecture. By that I mean that though there is no proof that something is the case, this is the most likely scenario, based upon the facts presented. I'll use itallics when speculating- and cite the facts with which I have drawn the hypothesis. So, we first glimpse Louisa Knight as the mother listed on the birth certificate of one Henry Price, born 8 February 1857. His birth took place in Magpie, Victoria- a suburb of Ballarat. Though he was born in February, his birth was not registered until 22 December of that year. The informant was his father, Alexander Price, a 25 year old Miner from Norway. Louisa was listed as being 23 and said she was born in Parramatta, NSW. Alexander said that they were married in December of 1853 in Geelong and he lists one living "issue". It's not clear whether or not he is referring to this child or one previous. As it turns out, Henry Price was my 2nd Great Grandfather. He is listed everywhere else as "William" Henry Price and it's not clear how that new first name came about. Two years later on February 10, 1859, we have the birth of another boy, Edward. (He later became Edward "Francis" Price- but I guess Louisa and Alex liked to add to names later on) Most of the details are the same as before, but they are now living in Clunes- another popular gold-rush town. It now says that they have three living boys at home- and as Louisa is the informant this time- I suppose she is counting Edward as one of the three. I've yet to find any evidence of a first-born other than on Louisa's death certificate. Alex is still Norwegian and is now listed as a carpenter. On January 27, 1861, Louisa and Alexander are married in St Paul's Church in Clunes. Though they have always maintained in their son's birth records that they were married in Geelong in 1853- this appears to be the first "official" wedding. It is my understanding that during the gold rush, people living in the fields often married without official recognition other than intent. There's also the chance that they were trying to save face- but regardless- there were three sons of this union before they were legally married. Thanks to my newly found cousin, Sam Price, I obtained a copy of the actual certificate from the wedding (as opposed to just the registry). Alexander's parents are listed as Peter Price (carpenter) and Martha Maria Holden. He maintains that he was born in Christiania, Norway- and indeed, those in my Price family whom have tested do have varying percentages of Scandinavian DNA. The real mystery is that "Price" is not a Norwegian name- though I've been told that Holden is. There's a chance that Alexander made up his name to sound more english- or perhaps his father was an immigrant who settled in Norway. If there are any Norwegians reading this that would like to search for Prices living in Oslo in the early 1800's I would be extremely grateful. Louisa's parents are listed as Henry Knight (Sailor) and Isabella (no maiden name). The fact that Louisa was born in Parramatta could suggest that one or both of her parents were convicts. Parramatta was known for it's institutions that housed female convicts and their children. In some documents Louisa says that her father was a "Sea Captain". One might suggest that perhaps he was the captain (or a mariner) on a convict ship that was transporting Isabella to Australia. As of now, I am unable to locate any birth record for Louisa- or the existence of her parents. June 4, 1861 is the birthdate of Francis Walter Price. There was always a rumor in the Price family that my 2nd G Grandfather had a brother named Walter that lived in Warrnambool- but they didn't talk. 1861 proved a busy year for our Louisa. In the August 24th issue of The Ballarat Star she testified in the Clunes Police Court as a witness to a theft. While I have no proof that this is "our" Louisa Price- there is a good chance that it was. She was married to a miner and likely lived in a tent in the goldfields- and we will learn later that she is not afraid of a courtroom. Charles Thomas Price was born on September 19, 1863. Most of the details are the same- however, this time Louisa only lists Francis Walter as previous issue. This is also the last mention of a living Alexander Price in any documents. On July 24, 1867- a daughter is born. Her name is Sarah Jane and there is no father listed on her birth certificate. 1869 to 1873 appear to be a tumultuous time for Louisa. I have just uncovered some of these details in the past few days. In this case, it really paid to purchase birth and death certificates. It's always a gamble because you're going to fork out twenty bucks for a photo copied image that may or may not provide some new information. 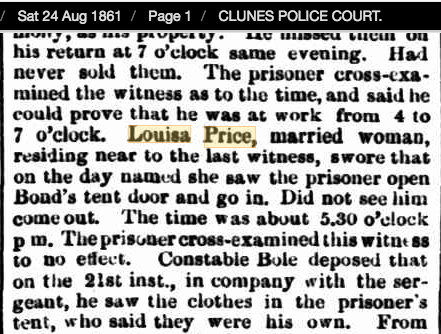 In December 1869, there is a newspaper article regarding a court case in Clunes where Louisa is having a dispute with a man named James Davey, regarding a stable on a "creek reserve" property that had been purchased by Louisa. Apparently the stable belonged to him even though the property belonged to her- so he was told to remove the stable and there was some sort of financial deduction that I don't really understand...anyway...so there's that. In April of 1870, Louisa has a son named Thomas James. There is, once again, no father listed. In February 1872, she has another son, James. Here's where things really became interesting to me. I found a death registration for another Louisa Price in 1873. On further examination, I notice that the mother is listed as Louisa Price as well. At this point, I bit the bullet and purchased the death record- in hopes that it would provide more information. There was no father listed, however, there were two new pieces of information. First of all, the informant is "Alice Knight- friend". Hmmm, this is the first time I have heard of this person- and the fact that she is a Knight is of extreme interest to me as Knight is Louisa's maiden name. Louisa (baby) died at six days old- and what really caught my attention was her middle name- Davey. Immediately that name rang a bell. It had been a while since I had seen the newspaper clipping about the stable- so I rifled back through my files and, lo and behold, not only is James Davey mentioned in that clipping from December 1869, but there is also another court dispute in June of 1873 between the two involving "abusive language". Baby Louisa is born just four months later. I went ahead and purchased the birth and death records for the two boys. Sure enough, there is no father listed- but James Davey is the informant- and he is identified as "putative father". These are the type of discoveries that make genealogists positively giddy. We run to our husband in his office and regale him with the details of what we just unearthed during about eight straight hours in front of our computer. When we fail to get the reaction we feel we deserve we then go back to our computer and blog about it..
Just kidding. Not really. Actually, my husband is very supportive of all my endeavors- but this is such a part of our daily life now that I'm sure it all sounds like white noise to him. Thankfully I have lot's of geni Facebook friends who "get it". But wait- there's more. When next we meet Louisa, it is June 15, 1874 and she is marrying John Williams Trevan. The wedding takes place in "a private house in Clunes" and is performed by a Methodist minister. John is a widow and has four living children and one deceased. Louisa says that her husband died in 1862 and she has 4 living children and 3 deceased. Alice Knight is listed as a witness. (I need to know about Alice Knight). Louisa goes on to have three more sons with John Trevan- all of whom, sadly, also die in infancy. I haven't purchased their death certificates yet (I'm a little tapped out...)- but the deaths of the previous three suggest a congenital heart defect. Edit: further investigation has lead me to believe that the name is possibly Otmer. This is, in fact, a Norwegian name. Still no records of birth or death. Edward Price actually died at the age of 25 in Rochester, Victoria. The fact that Charles thought he was still alive reinforces my belief that this family was quite divided. In Edward's obituary, the only family mentioned is "brother, Harry Price, of Macedon". It has taken me a long time to get this far. For years, I thought that my 3rd G Grandparents were Peter Price and Lucy Blake. Those are the names listed William Price Sr's death certificate by his son, William Jr. There was clearly not much talk around the old homestead of family. Lucy is indeed similar to Louisa- but where did Blake come from? Marriage records list Alexander's father as Peter- so maybe that was a nickname.... My point is- lot's of people guessed or made things up- so don't take death certificates as fact unless you have back-up. One last point. I recently went back to review all of the birth certificates that I have purchased over the years. I was scanning the 1893 registry of Grace Dorris Price, sister of William Henry Price Jr. Suddenly, a name jumped out at me. Listed as a witness was "Mrs Trevan". A year ago that name meant nothing to me- but with this, I was finally able to connect Louisa Price to my direct line. My final proof has been science. Thanks to DNA testing I was matched to a cousin named McCarron. His G Grandmother was a lady by the name of Sarah Jane Row (nee Price). With further research, I was able to locate Sam Price- a direct descendant of Walter Price (from Warrnambool). Sam and his cousin, Sandra, have both tested and guess what- we all match. I have managed to find direct descendants of two of my 3rd g grandparents other children. A year ago- we never knew of each other's existence- and nobody in my Price family had ever heard of Louisa Knight Price Trevan. Louisa Price was a feisty warrior. I now know so much about her- but there is so much more to uncover. I can't wait for more revelations. If you've ever thought of doing DNA testing- please do it. Come on in- the water's fine. History is coming to life for all of us. We all have so called skeletons in our closets- but that's just the point. Our ancestors don't define us- they provide us with context, clarity and truth. There is nothing more important than truth. This is my mantra.